The Red high heels lyrics by recording artist Kellie Pickler on her album Small Town Girl has generated a lot of interest in this shoe art print so I've included them below my artwork. The High Heels Gallery 1 has beautiful artwork of shoes and purses art prints for sale. 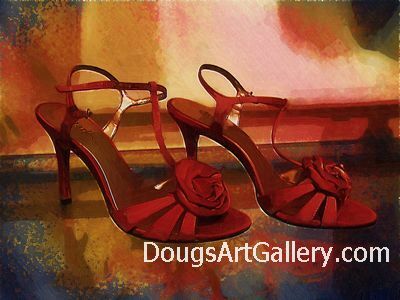 High heel shoe art of high heels titled "If the shoe fits buy one in every color" by Doug Dourgarian $120 USD. This high heel shoe art is the second in the series from Rome's fashion shopping district. Lots of fine leather and Italian designer fashions and high heel museum. This store window in Rome Italy's Via Del Corso shopping district near the Spanish Steps was the first piece of my high heel shoe art with purses and Italian designed shoes. These designer decorated flip flops are decorated with lots of bling bling type glitter in a beautiful image for your wall. The decorative shoe I love in black with embroidery and a large bow on the heel, this one is very dressy but not a high heel. The Diamond Shoes print is rich in color and are elegant high heels. The Purse Forum was an idea from a Purse Party, it is a color print featuring four purses in the Andy Warhol style display. Click here to leave Red high heels lyrics for more links to artistic styles, artists and their online art galleries, art prints and art posters. Browse the links found at the bottom of Home Page.